The Tuckasegee River, known as the “Tuck,” originates near Cashiers, North Carolina and flows through the towns of Sylva, Dillsboro, Whittier and Bryson City on its way to Fontana Lake. The Tuck is the only river in Western North Carolina which offers rafting for children as young as 4 years old. The river is the perfect choice for beginner and intermediate paddlers. 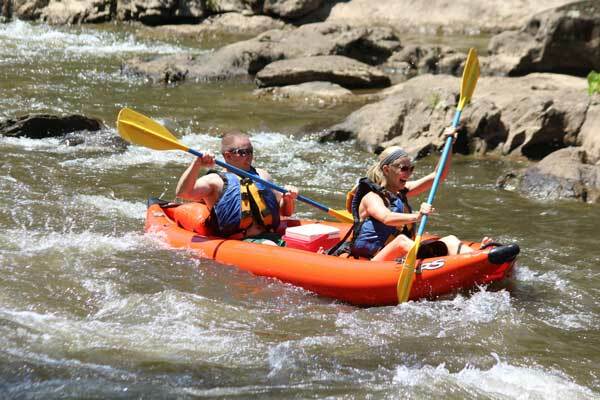 Your trip with Smoky Mountain River Adventures takes you 5.2 miles through quiet areas of leisurely floating mixed with fun and exhilarating class I and II rapids. Along the way, you can enjoy our famous jumping rock, swimming in deep pools, and observe the many birds and animals that call the river home. Your 2.5 hour trip ends at our rafting shop, with a free ice pop. No waiting for a shuttle to pick you up. Your dry clothes and car are right there for your convenience. 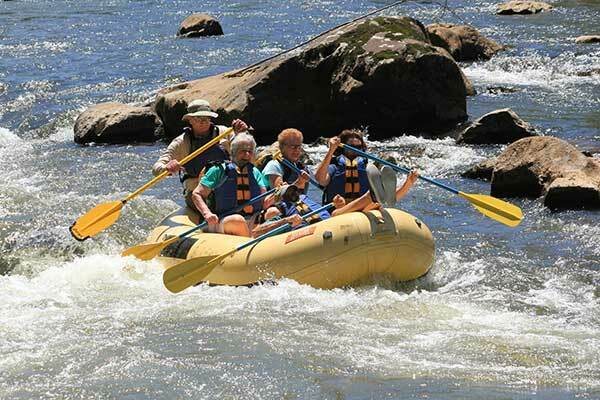 Favorite River Trip of Multi-gen Families: ages 90+! Our fully guided trips are perfect for first time rafters. Let our experienced guides help you navigate the rapids in style. Different size rafts seat 3 to 7 guests, plus your guide. We’ll select the right size raft for your group and the water level! Raft rentals are recommended for families or groups with prior paddling experience. Different size rafts can accommodate 3 up to 8 people – we’ll help you get the right size for your adventure. For the confident paddler who wants to double up with their child, spouse, or friend. This inflatable double kayak is ideal for 3 people, and you can fit a 3rd small kiddo, too. Double ducks are lighter, float higher in the water and are more responsive than rafts. Huge fun! Go solo and create your own adventure. 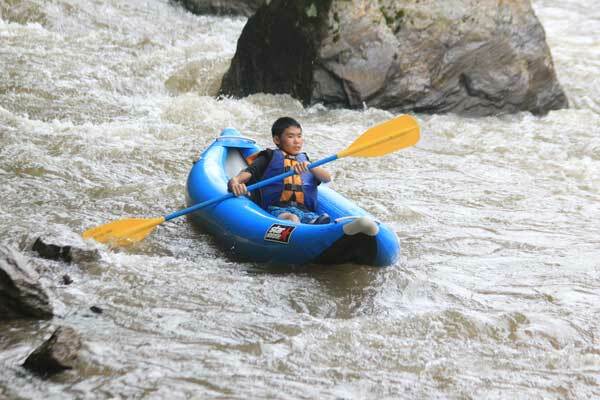 Single inflatable kayaks are more stable than hard plastic kayaks while allowing you to easily move through the rapids. These lightweight highly maneuverable duckies are an absolute blast to paddle on the “Tuck”! 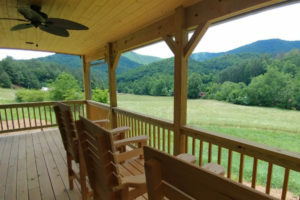 We are excited to offer our new cabin, Lazy Acres at Highfield Cabins, as a lodging option for your stay in the North Carolina Smokies. Enjoy wonderful field and mountain views along with the calming sounds of nearby Greens Creek during your stay at this mountain retreat. 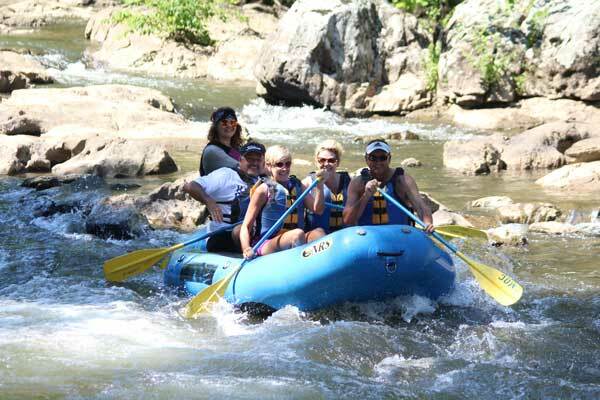 A Smoky Mountain River Adventure rafting discount is included with cabin reservation.